In 1967, Greg Pryor was an undrafted high school baseball player. His dad bribed the head coach of Florida Southern College in Lakeland, FL to give him a small scholarship. He made the NCAA Division II All-America honors in 1970 and 1971 and signed a pro contract with the Washington Senators. He played in MLB during 10 seasons and was a member of the 1985 World Champion Kansas City Royals. 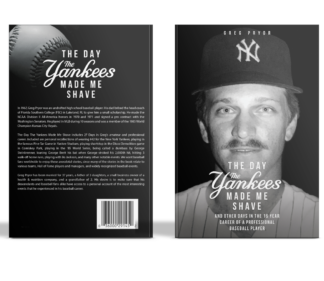 The Day the Yankees Made Me Shave includes 27 Days in Greg’s amateur and professional career. Included are personal recollections of wearing #42 for the New York Yankees, playing in the famous Pine Tar Game in Yankee Stadium, playing shortstop in the Disco Demolition game in Comiskey Park, playing in the ‘85 World Series, being called a dumbass by George Steinbrenner, loaning George Brett his bat when George stroked his 2,000th hit, hitting 3 walk-off home runs, playing with Bo Jackson, and many other notable events. Baseball fans worldwide will enjoy these anecdotal stories, since many of the stories in the book relate to various teams, Hall of Fame players and managers, and widely recognized baseball events. Greg Pryor has been married for 37 years, a father of 3 daughters, a small business owner of a health & nutrition company, and a grandfather of 2. His desire is to make sure that his descendants and baseball fans alike have access to a personal account of the most interesting events that he experienced in his baseball career.